Name Variation Margaret K. Gruber was also known as Wittmere. Married Name circa 1929 As of circa 1929,her married name was Schrank. Margaret K. Gruber was born on 14 October 1909 at Wisconsin. She was the daughter of Christian D. Gruber and Katherine M. Stelter. Heinrich Marvin Gustav Schrank married Margaret K. Gruber, circa 1929. She died on 2 September 1975, at age 65. [S181] Wisconsin, Sauk Co Cemetery Records Vol 2, pg 70. [S250] U.S. Federal Census 1930 U.S. Federal Census, by Ancestry.com, ED56-22. Dwelling 35. 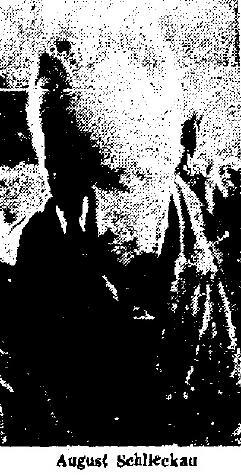 Carl Orlen Mattke was born on 5 August 1912. Wanita Bertha Catharina Schrank married Carl Orlen Mattke, on 14 May 1948. He died on 2 December 1965, at age 53. Roland C. Nelson was born on 4 July 1913. He was the son of Nels Peter Nelson and Leona May Bodendein. Roland C. Nelson married Helen Anna Elisabeth Schrank, daughter of Gustave Reinhold Schrank and Emma Steckelberg, on 26 July 1933. Roland C. Nelson died on 6 August 2007 at age 94 Roland C. Nelson, 94, of Madison, died Monday, August 6, 2007, at Oakwood Village in Madison. He was born on July 4, 1913 in Lime Ridge, the son of Nels Peter and Leona May (nee Bodendein) Nelson. On July 26, 1933, he was united in marriage to Helen A. Schrank at St. Peter’s Lutheran Church in Loganville. 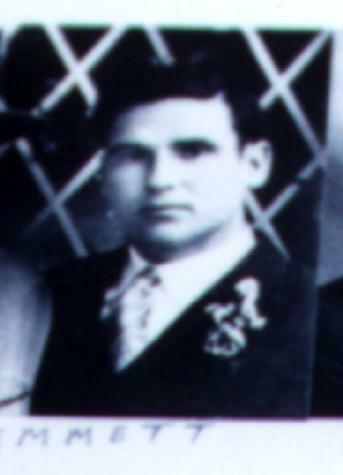 Roland graduated from Lime Ridge High School in 1930. Roland began a long career in the telephone industry as a lineman for the Lime Ridge Telephone Company. He had a 47 year career with GTE, retiring in 1978. Roland enjoyed golf, woodworking and could fix almost everything. He was a member of the Elks Club and the Kiwanis Club. He is survived by his wife, Helen of Madison; sister, Audrey Gasser of Reedsburg; granddaughter, Tracy Nelson (fiancee Dennis Slauson) of Sun Prairie, daughter-in-law, Darlene Zastrow of Sun Prairie, nieces, nephews, along with other relatives and friends. He was preceded in death by his parents; daughter, Judith Nelson on March 28, 1964; son, Charles Nelson on Jan. 4, 1992; grandson, Jay Nelson on June 10, 1991; two brothers, Amos and Donald, and a sister, Bernadine. Grave side services for Roland Nelson will be conducted at 1 p.m. on Wednesday, Aug. 8, 2007, at St. Peter’s Lutheran Cemetery in Loganville with Reverend Christopher Miller officiating. In lieu of flowers, memorials of remembrance may be made to the American heart Association or American Cancer Society. The Farber Funeral Home in Reedsburg is assisting the family with the arrangements. He was buried after 6 August 2007 at Saint Peters Lutheran Church Cemetery, Loganville, Sauk, Wisconsin. Married Name 12 July 1946 As of 12 July 1946,her married name was Schrank. Arbutus Ann Weigel was born on 28 July 1923 at Kansas. She was the daughter of Fredoline August Weigel and unknown (?). Gerhardt Benjamin Harry Schrank married Arbutus Ann Weigel, on 12 July 1946. Arbutus Ann Weigel obtained US Social Security Card at Illinois; last benefit Dayton, Montgomery, Ohio. [S341] Ohio, Ohio Deaths, 1958-2000, Certificate: 051038. [S181] Wisconsin, Sauk Co Cemetery Records Vol 2, pg 69. [S250] U.S. Federal Census 1930 U.S. Federal Census, by Ancestry.com, ED26-9. Dwelling 132. Name Variation Herman H. Schulenburg was also known as Johann Heinrich Herman. Herman H. Schulenburg was born on 19 January 1887 at Westfield, Sauk, Wisconsin. He was the son of Henry Schulenburg and Elizabeth (?). Herman H. Schulenburg married Louise Schrank, daughter of Ferdinand Schrank and Bertha Roloff, on 16 August 1911 at St. Peter's Lutheran Church, Loganville, Sauk, Wisconsin. Herman H. Schulenburg died on 5 March 1963 at age 76. He was buried after 5 March 1963 at Saint Peters Lutheran Church Cemetery, Loganville, Sauk, Wisconsin. Herman H. Schulenburg obtained US Social Security Card at Wisconsin; last residence Wisconsin. On 15 June 1917 at World War I Draft Registration, Sauk, Wisconsin. [S245] U.S. Federal Census 1900 U.S. Federal Census, by Ancestry.com, ED149. Dwelling 32. [S244] U.S. Federal Census 1910 U.S. Federal Census, by Ancestry.com, ED130. Dwelling 83. [S243] U.S. Federal Census 1920 U.S. Federal Census, by Ancestry.com, ED171. Dwelling 164. [S250] U.S. Federal Census 1930 U.S. Federal Census, by Ancestry.com, ED56-39. Dwelling 148. Harold Heinrich Herman Schulenburg married Elsie A. Schulte, daughter of Friedrich August Wilhelm Schulte and Maria Louise Neuman. Harold Heinrich Herman Schulenburg was born at Loganville, Sauk, Wisconsin, on 13 November 1912. He was the son of Herman H. Schulenburg and Louise Schrank. Harold Heinrich Herman Schulenburg died on 22 February 1964, at age 51. 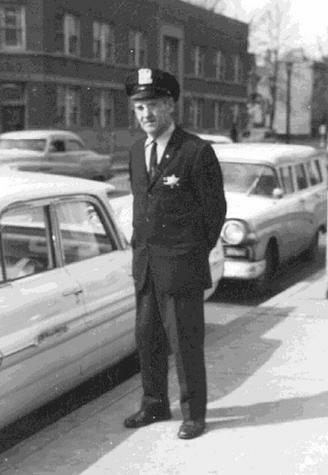 His body was interred after 22 February 1964 at Loganville, Wisconsin, at St. Peter's Lutheran Cemetery. Name Variation Rosella L. Schulenburg was also known as Rosella B. Married Name 18 March 1935 As of 18 March 1935,her married name was Kaske. Rosella L. Schulenburg was born at Loganville, Sauk, Wisconsin, on 26 March 1914. She was the daughter of Herman H. Schulenburg and Louise Schrank. 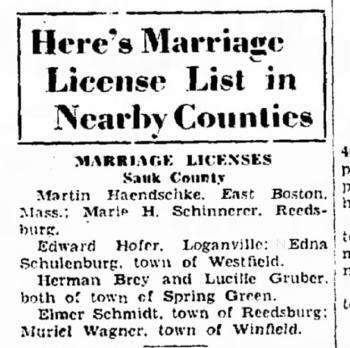 Rosella L. Schulenburg married Albert F. Kaske on 18 March 1935. 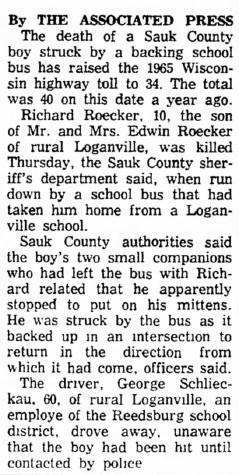 Rosella L. Schulenburg died on 19 November 1993 at age 79 Rosella L Kaske, 79, of Reedsburg, formerly of Wonewoc, died unexpectedly on Fri, Nov 19, 1993 at the Reedsburg Memorial Hospital. 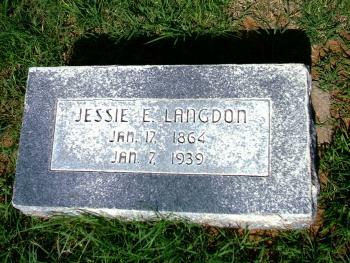 She was born on March 26, 1914 near Loganville the daughter of Herman Schulenburg & Louise Schrank. On March 18, 1935 she was united in marriage to Albert F Kaske. He preceded her in death in October 1977. Rosella lived in Wonewoc for many years until moving to Reedsburg about 6 years ago. She was an active member of Faith Lutheran Church and its Ladies Aid, a member of the Reedsburg Senior Citizens and she enjoyed playing cards. Survivors include 2 sons, Dale (Audrey) Kaske and Donald (Gail) Kaske, both of Racine; 3 grandchildren, Kelly, Kristi and Kent; 2 sisters; Edna Hofer of Reedsburg and Elda (Gerhard) Luetkens of Loganville; nieces and nephews; other relatives and friends. She was also preceded in death by 4 brothers; Harold, Norbert, Lawrence and Marvin Schulenburg. Funeral services were held at 11 am on Mon, Nov 22, 1993 at Faith Lutheran Church in Reedsburg with Rev David Maertz officiating. Interment was made in St Paul’s Lutheran cemetery in Wonewoc. The family received friends from 2-5 pm on Sun at the Hammer-Hoff Funeral Home in Reedsburg. The Hammer-Hoff Funeral Home is serving the family. She was buried after 19 November 1993 at St Paul’s Lutheran, Wonewoc, Grant, Wisconsin. Married Name May 1939 As of May 1939,her married name was Hofer. 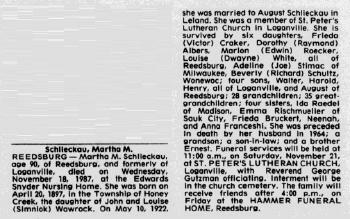 Edna Dorothea Anna Schulenburg was born at Loganville, Sauk, Wisconsin, on 25 February 1916. 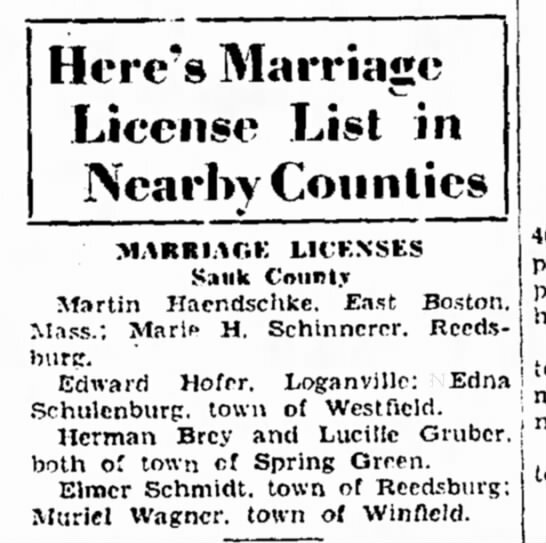 Edna Dorothea Anna Schulenburg married Edward John Hofer, son of John A. Hofer and Wilhelmina A. Spohnholz, in May 1939 Sauk county marriage license reported in The Capital Times on 07 May 1939. Edna Dorothea Anna Schulenburg died on 11 January 2001 at age 84 Edna Schulenberg Hofer obituary. She was buried after 11 January 2001 at Saint Peters Lutheran Church Cemetery, Loganville, Sauk, Wisconsin. Edna Dorothea Anna Schulenburg obtained US Social Security Card at Wisconsin; last residence Reedsburg, Sauk, Wisconsin. Name Variation Norbert Reinhold Albert Schulenburg was also known as Norbert A.
Norbert Reinhold Albert Schulenburg was born at Loganville, Sauk, Wisconsin, on 17 June 1920. Norbert Reinhold Albert Schulenburg married Ida Gehrke, daughter of Frank Albert Carl Gehrke and Wilhelmina A. Spohnholz, on 9 October 1948. Norbert Reinhold Albert Schulenburg died on 2 January 1979 at age 58 Norbert R. Schulenberg obituary. He was buried after 2 January 1979 at Saint Peters Lutheran Church Cemetery, Loganville, Sauk, Wisconsin. Norbert Reinhold Albert Schulenburg obtained US Social Security Card at Wisconsin; last residence Reedsburg, Sauk, Wisconsin. Married Name 23 May 1947 As of 23 May 1947,her married name was Luetkens. 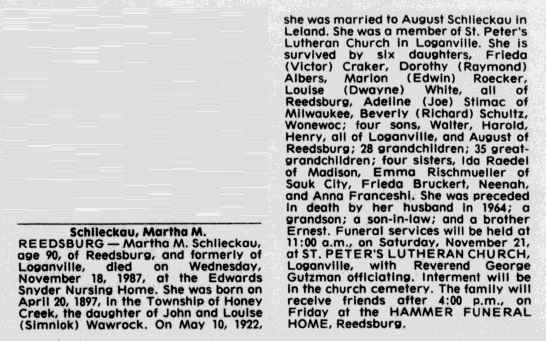 Elda M. Schulenburg was born at Loganville, Sauk, Wisconsin, on 5 May 1923. 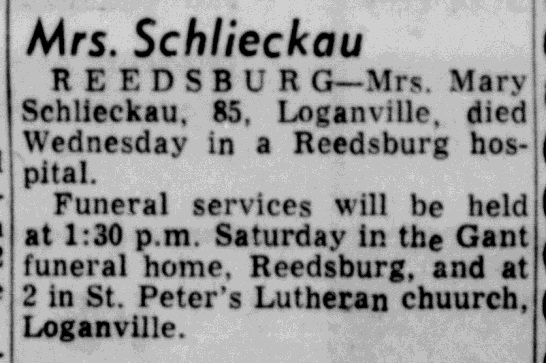 Elda M. Schulenburg married Gerhard A. Luetkens, son of August Luetkens and Emma A. Koenig, on 23 May 1947. Elda M. Schulenburg died on 29 April 2016 at age 92 Elda M. Luetkens, age 92, of Reedsburg, died on Friday, April 29, 2016 at Meadow View Memory Care in Baraboo. 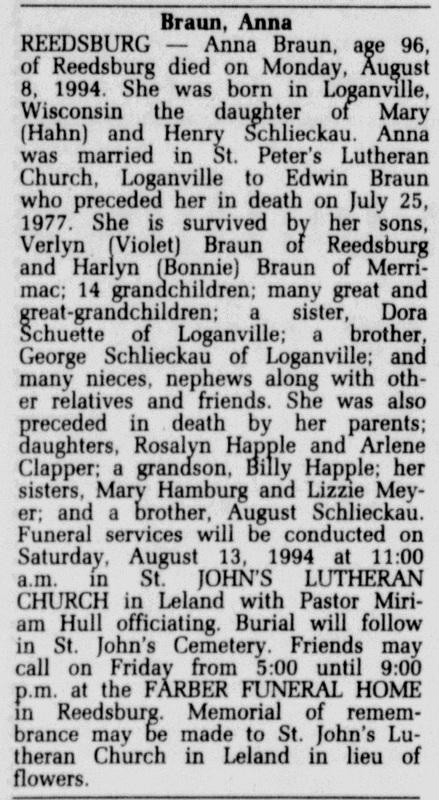 She was born on May 5, 1923 in the Town of Westfield, Sauk County, the daughter of Herman and Louise (Schrank) Schulenburg. On May 23, 1947, she was married to Gerhard "Barney" Luetkens. Elda worked at Hankscraft in Reedsburg for many years. She was a faithful member of St. John Lutheran Church in Loganville where she and Barney served as custodians for many years. Elda was also a member of the Loganville Fire Department Auxiliary. She enjoyed doing crafts in her spare time. Survivors include her two children: Betty (Dennis) Adcock, of Rockford, IL and Dennis (Jean) Luetkens, of Reedsburg; four grandchildren: Tina (David) Bridegan, Tammy (Jacob) Altensey, Chad (Christine) Luetkens and Jared Luetkens; five great grandchildren: Sydney and Connor Bridegan; Chase and Caleb Altensey; and Camden Luetkens; her sister-in-law: Violet Vinz, of Reedsburg; nieces and nephews; other relatives and friends. She was preceded in death by her husband, Barney, on December 13, 2008; her parents; four brothers: Harold, Norbert, Lawrence and Marvin Schulenburg; and two sisters: Rosella Kaske and Edna Hofer. Funeral services will be conducted at 11:00 A.M. on Monday, May 2, 2016 at St. John Lutheran Church in Loganville with Pastor Tim Anderson officiating. Interment will be in St. John's Cemetery. There will be a visitation from 9:30 A.M. until the time of the service on Monday at the church. In lieu of flowers, memorials to St. John Lutheran Church or the Alzheimer's and Dementia Alliance would be appreciated. The family wishes to extend a huge thank you to the angels at Meadow View Memory Care, Meadow Ridge Assisted Living and Agrace Hospice. Elda finally received her wish to "go home". The Hoof Funeral Home is serving the family. Lawrence G. Schulenburg was born at Loganville, Sauk, Wisconsin, on 5 June 1925. Lawrence G. Schulenburg died in May 1975 at age 49. Lawrence G. Schulenburg obtained US Social Security Card at Wisconsin; last residence not specified. Marvin K. Schulenburg was born at Loganville, Sauk, Wisconsin, on 26 November 1929. Marvin K. Schulenburg died in May 1986 at age 56. Marvin K. Schulenburg obtained US Social Security Card at Wisconsin; last residence Loganville, Sauk, Wisconsin. Name Variation Emily Marion Bowell was also known as Boswell. Name Variation Emily Marion Bowell was also known as Bowles. Name Variation Emily Marion Bowell was also known as Marion Emily. Married Name 26 June 1901 As of 26 June 1901,her married name was Mercer. 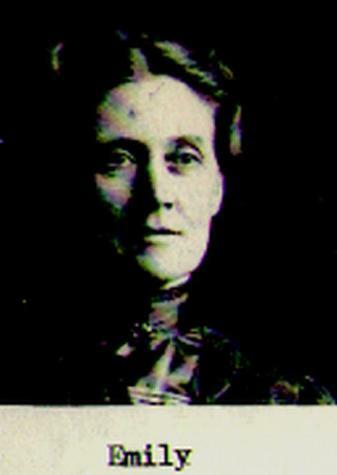 Emily Marion Bowell was born on 21 May 1863 at Iowa, Wisconsin. Emily Marion Bowell married Amos Mercer Jr., son of Amos Erastus Mercer and Emeline Tanner, on 26 June 1901 at minister's home, Buena Vista Township, Richland, Wisconsin. Emily Marion Bowell died on 17 January 1963 at home, Spring Green, Sauk, Wisconsin, at age 99 Emily (Bowell) Mercer death notice. Emily Marion Bowell and Amos Mercer Jr. were photo of Emily and Amos Mercer Jr.
Emily Marion Bowell had zero children. 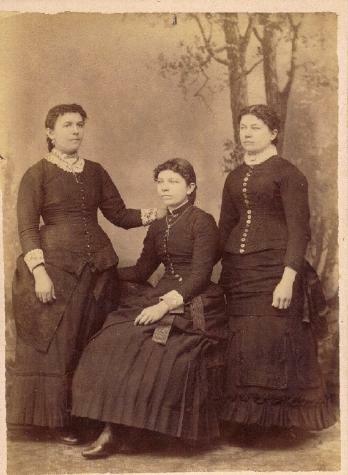 She took guardianship in 1884; When Rose died, Emily Boswell Mercer took Welcome and Rose Hoxie's youngest daughter (Kate), who was only 4 years old, to raise. In January 1920 Mrs Ames Mercer (Emily Bowell), West Spring Green, has left for a month's visit with her sister, Mrs George Kerney (Kate Hoxie), Minneota, Minn. The ladies are sisters. [S246] U.S. Federal Census 1880 U.S. Federal Census, by Ancestry.com, NA Film Number T9-1429 Page Number 252B. [S245] U.S. Federal Census 1900 U.S. Federal Census, by Ancestry.com, ED145. Dwelling 22. [S373] U.S. Federal Census 1940 U.S. Federal Census, by Ancestry.com, ED56-36. Sheet 6b. Dwelling 98. George C. Schlieckau was born on 29 April 1904 at Sauk, Wisconsin. He was the son of Henry Schlieckau II and Mary Catherine Hahn. George C. Schlieckau married Esther M. Getschman, daughter of Julius Gottlieb Getschman and Lillie H. Kreofsky, on 14 June 1930. George C. Schlieckau died on 29 December 1999 at Sauk, Wisconsin, at age 95 George C Schlieckau obituary. 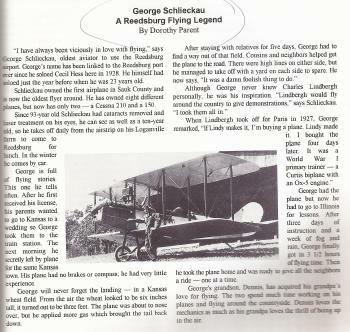 George Schlieckau, Sauk County's first pilot. George C. Schlieckau obtained US Social Security Card at Wisconsin; last residence Reedsburg, Sauk, Wisconsin. last name spelled as Schliekau.. 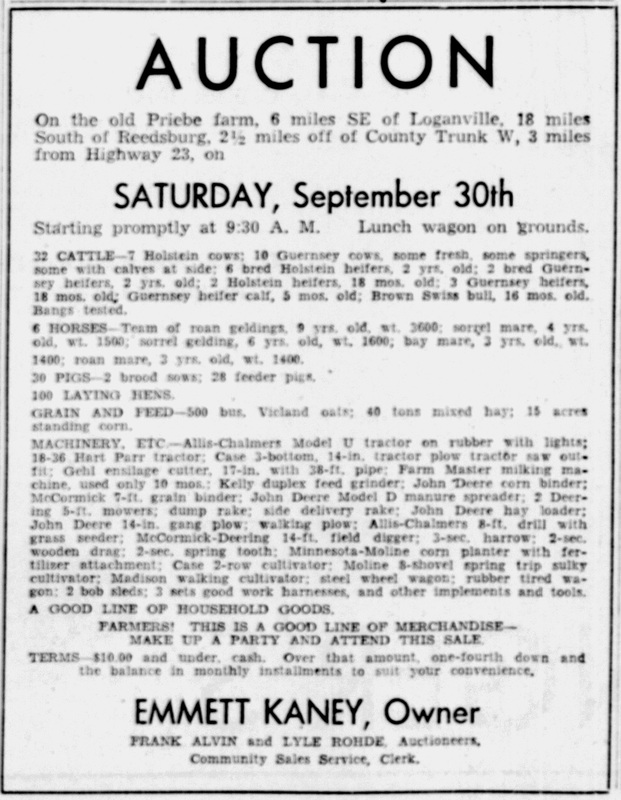 In April 1930 at Loganville, Sauk, Wisconsin, George Schlieckau experiment on Loganville farm using only tractors, without horses. "Farmers hereabouts are awaiting the results of the experience of George Schliechon (Schlieckau) on his 160 acre farm. Mr. Schliechon (Schlieckau) proposes to use tractors, doing without horses entirely"
From his daughter-in-law, Ellen Kay (Feb 2019): "George was the first farmer in the State to give up horses and transition to all mechanized farming. He told me, Farmers would travel from all over the state to see his operation and ask questions. Likely due to that article being published in the State Journal. You need to remember 160 acres was a large farm back then. The typical farmer was probably working 40 acres or less using horses back then. 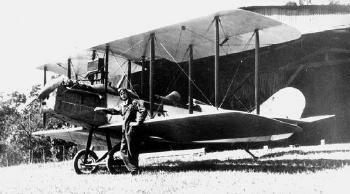 He was also the first person in Sauk county to own an aircraft purchased a few years earlier, just one week after Charles A. Lindbergh crossed the Atlantic. He was very progressive in early life. He was 26 in 1930." He was educated in 1940 at through 8th grade. 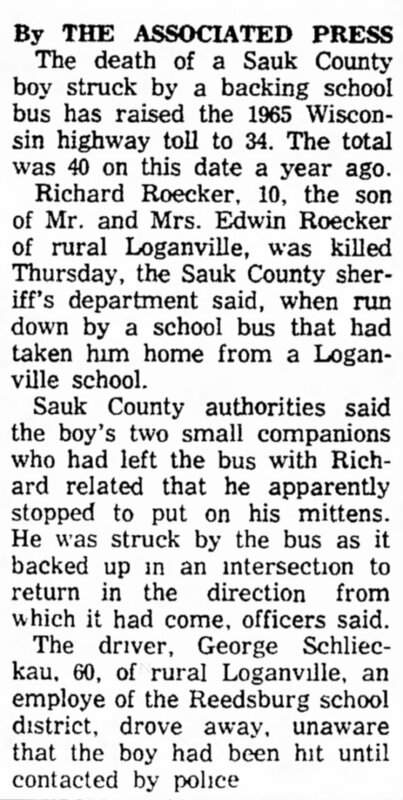 On 14 January 1965 George Schlieckau accidentally backed school bus over his grandnephew, Richard Roecker. [S179] Wisconsin Sauk County Cemetery Headstones Vol. 1. [S243] U.S. Federal Census 1920 U.S. Federal Census, by Ancestry.com, Sheet 12A. Stamp 140. Dwelling 231. ED 171. [S250] U.S. Federal Census 1930 U.S. Federal Census, by Ancestry.com, ED56-13. Dwelling 162. [S215] Sesquicentennial History Committee, Reedsburg Remembers 150 Years, Page 227. Name Variation Henry Schlieckau II was also known as Johann Juergen Heinrich. Henry Schlieckau II was born at Hanover, Germany, on 20 March 1862. He was the son of Henry Schlieckau and Maria Harms. Henry Schlieckau II married Mary Catherine Hahn, daughter of Johann Juergen Hahn and Dorothea Elisabeth Kohlmeier, on 2 March 1887. Henry Schlieckau II was listed as a beneficiary in Henry Schlieckau's will on 24 December 1901 at Sauk, Wisconsin. Henry Schlieckau II died on 23 September 1947 at Sauk, Wisconsin, at age 85. HENRY SCHLICKAU. One of the fine farms of Westfield Township is that owned by Henry Schlickau, and it has repaid his industry and intelligent management throughout the thirty years he has lived there, giving him prosperity and an enviable position among the representative citizens of Sauk County. Mr. Schlickau was born in Hanover, Germany, March 20, 1862, a son of Henry and Mary (Harms) Schlickau. When he was seven years of age he came with his parents to America. The family arrived in Illinois in May, 1869, and the following August went to Westfield Township of Sauk County. His parents bought 120 acres of wild land. It was a tremendous task to cut down the trees and only gradually was the change made from the wilderness into settled conditions of agriculture. The father lived a long and industrious life and passed away in May, 1901, while his wife died in February preceding his death. 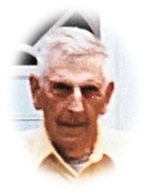 Henry Schlickau, Sr., was an active member and an official in the Lutheran Church. Their children were Henry, William, Annie and Lizzie. The son William married Katherina Elling and now lives in Kansas. Annie is the wife of Carl Stoletie of Hill Point, Sauk County. Lizzie married Charles Giffert, of Westfield Township. 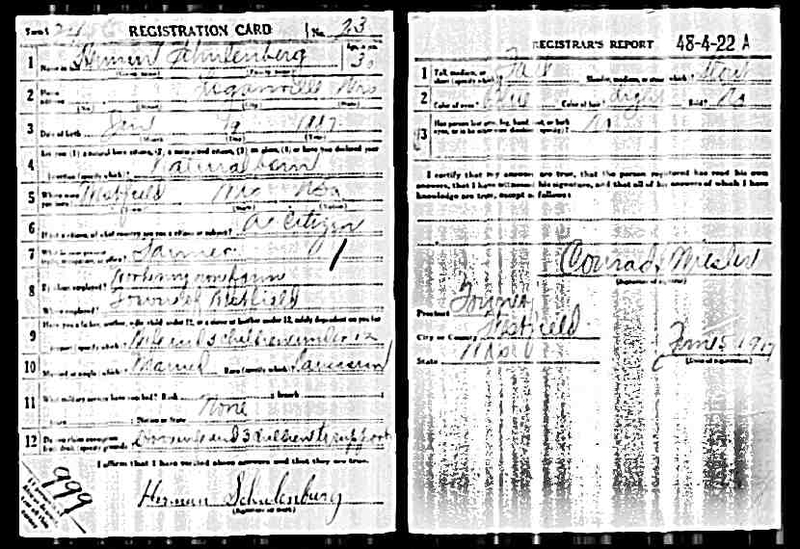 Mr. Henry Schlickau married, March 2, 1887, at the age of twenty five, Miss May Hahn, daughter of George and Dorothy Hahn, of Westfield Township. In the same year of their marriage Mr. and Mrs. Schlickau located on their present farm, and here they have reared their family and while making ample provisions for their training and comfort they have still been prospered and find themselves in a comfortable and valuable home and surrounded with all the comforts and good things of life. Mr. Schlickau is a progressive farmer, using the silo system of feeding, and has made many improvements on the farm by his own hands. He is a republican voter and an active member of the Lutheran Church. Mrs. Schlickau's brothers and sisters were: Catherine, now deceased; Henry, also deceased; Anne; and Dora. Anne is the wife of Fred Reineke, of Westfield Township. Dora married Christ Yenke, of Honey Creek Township. Catherine became the wife of Chris Neinmann, and he now lives in the State of Washington. Mr. and Mrs. Henry Schlickau have a bright and interesting family of six children, all of them still at home and unmarried. Their names and dates of birth are: August, 1888; Lizzie, 1889; Mary, 1894; Annie, 1898; Dora, 1901; and George, 1904. These children were well educated in the local public schools and also attended a school conducted by the Lutheran Church. 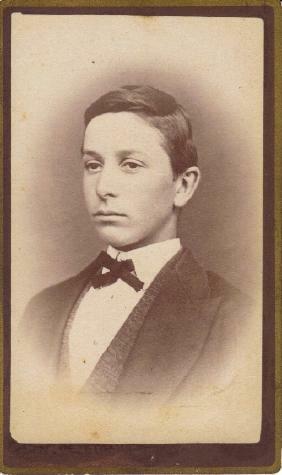 Henry Schlieckau II immigrated with Henry Schlieckau and Maria Harms on 2 June 1868; George arrived, by ship, in America with his older brother Henry and Henry's family in 1868. [S180] Wisconsin Sauk Co Cemetery Records Vol 6, Pg 71. [S247] U.S. Federal Census 1870 U.S. Federal Census, by Ancestry.com, Stamp 288. Page 89 Dwelling 68. [S246] U.S. Federal Census 1880 U.S. Federal Census, by Ancestry.com, NA Film Number T9-1446 Sheet 276D. Dwelling 28. [S245] U.S. Federal Census 1900 U.S. Federal Census, by Ancestry.com, ED149. Dwelling 69. [S250] U.S. Federal Census 1930 U.S. Federal Census, by Ancestry.com, ED56-22. Sheet 3A. Dwelling 73. Name Variation Mary Catherine Hahn was also known as Minnie. Name Variation Mary Catherine Hahn was also known as May. Name Variation Mary Catherine Hahn was also known as Katherina Dorothea Maria. Name Variation Mary Catherine Hahn was also known as Maria. Married Name 2 March 1887 As of 2 March 1887,her married name was Schlieckau. Mary Catherine Hahn was born on 25 October 1868 at Sauk, Wisconsin, also reported as Oct 1869. She was the daughter of Johann Juergen Hahn and Dorothea Elisabeth Kohlmeier. 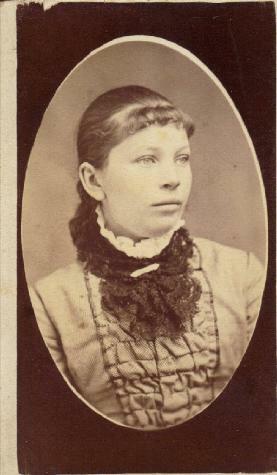 Mary Catherine Hahn married Henry Schlieckau II, son of Henry Schlieckau and Maria Harms, on 2 March 1887. 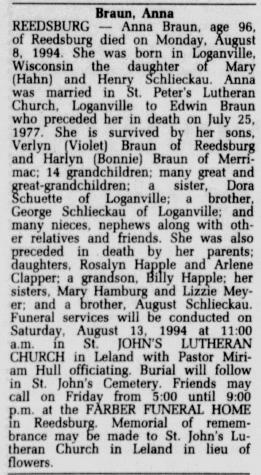 Mary Catherine Hahn died on 23 March 1955 at hospital, Reedsburg, Sauk, Wisconsin, at age 86 Mary (Hahn) Schlieckau obituary. Mary Catherine Hahn had 6 with 6 living in 1910 children. [S247] U.S. Federal Census 1870 U.S. Federal Census, by Ancestry.com, Stamp 298. Dwelling 223. [S246] U.S. Federal Census 1880 U.S. Federal Census, by Ancestry.com, Dwelling #84. August Schlieckau Sr. was born at Sauk, Wisconsin, on 3 January 1888. 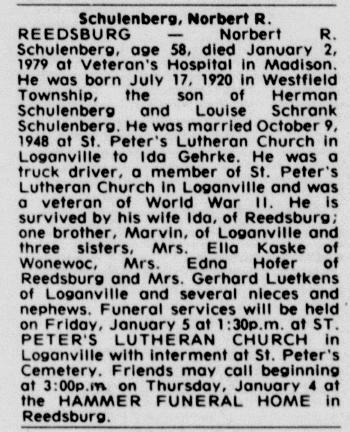 August Schlieckau Sr. died on 26 January 1964 at age 76 August Schlieckau obituary. Name Variation Anna Katherina Dorothea Schlieckau was also known as Annie. Anna Katherina Dorothea Schlieckau married Edwin Braun. Anna Katherina Dorothea Schlieckau was born at Sauk, Wisconsin, on 12 April 1898. 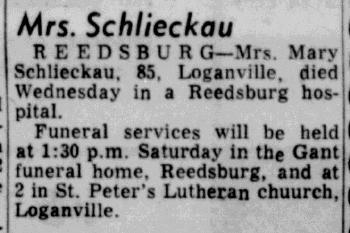 Anna Katherina Dorothea Schlieckau died on 8 August 1994 at Reedsburg, Sauk, Wisconsin, at age 96 Anna Schlieckau Braun obituary. Emmett Joseph Kaney was born at Loreto, Wisconsin, on 22 March 1901. Emmett Joseph Kaney married Catherine R. Meeler, daughter of Henry W. Meeler and Margaret Elizabeth Spengler, circa 1926. 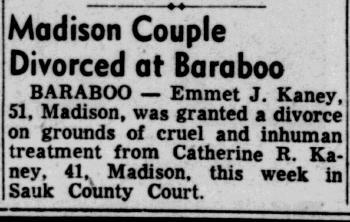 Emmett Joseph Kaney and Catherine R. Meeler were divorced in February 1953. 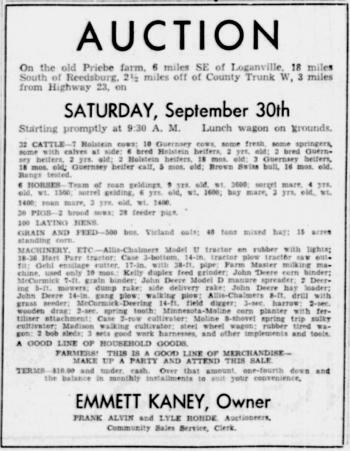 In September 1944 at Sauk, Wisconsin, Auction of Emmett Kaney property. 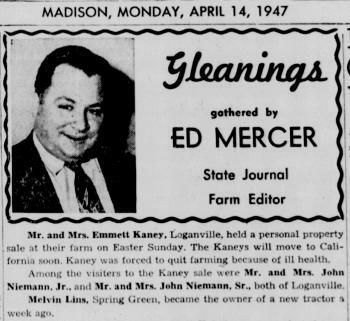 In April 1947 Emmett Kaney sale at farm, attended by John Niemann and John Jr. Article written by Ed Mercer, Mrs. John Niemann Jr's 2nd cousin. - The Good Ole Summer Time by Emmett J Kaney. 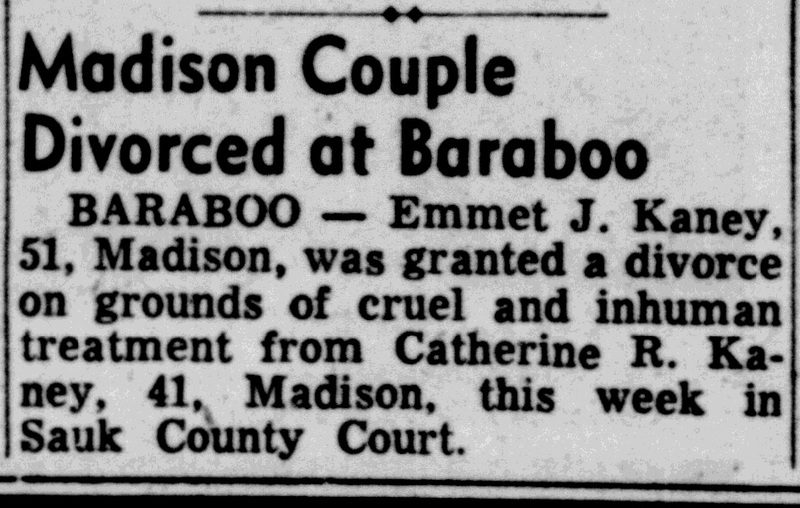 [S208] Reedsburg Times Press, February 1, 1990. Name Variation Robert E. Kaney was also known as Bob. Robert E. Kaney was born on 30 March 1927 at Wisconsin Dells, Columbia, Wisconsin. He was the son of Emmett Joseph Kaney and Catherine R. Meeler. Funeral services will be held for Robert Tuesday, January 14, 2014, at 10:30 am at Farber Funeral Home in Reedsburg. Visitation will also be on Tuesday, at the funeral home from 9:00 am until the time of service. Burial will follow services at St. Patrick’s Cemetery in Loreto. A memorial fund has been established in his name. 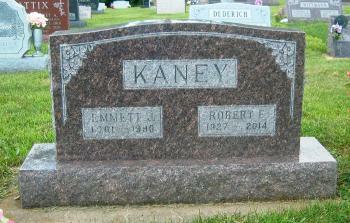 Robert E. Kaney lived in January 1990 at Adams, Adams, Wiscosnin. He lived in July 2008 at 936 County Rd E, Adams, Adams, Wisconsin. Married Name 10 May 1922 As of 10 May 1922,her married name was Schlieckau. Martha M. Wawrock was born at Wisconsin on 20 April 1897. She was the daughter of John Wawrock and Louise Simniok. Martha M. Wawrock died on 15 November 1987 at age 90 Martha Schlieckau, 90, Reedsburg, formerly of Loganville, died on Wednesday, November 18, 1987 at the Edward Snyder Memorial Nursing Home. She was born on April 20, 1897 in the Township of Honey Creek, the daughter of of John and Louise (Simniok) Wawrock. On May 10, 1922, she married August Schlieckau in Leland. She was a member of St. Peter's Lutheran church, Loganville. Survivors include six daughters, Frieda (Mrs. Victor) Craker, Dorothy (Mrs. Raymond) Albers, Marion (Mrs. Edwin) Roecker, Louise (Mrs. Dwayne) White, all of Reedsburg; Adeline (Mrs. Joe) Stimac, Milwaukee and Beverly (Mrs. Richard) Schultz, Wonewoc; fours sons, Walter, Harold, Henry all of Loganville and August Schlieckau, Reedsburg; 28 grandchildren; 35 great-grandchildren; four sisters, Ida Raedel, Madison, Emma Rischmueller, Sauk City, Frieda Bruckert, Neenah and Anna Franceshi. She was preceded in death by her husband in 1964; one grandson; one son-in-law and a brother, Ernest. Funeral services were conducted at 11 a.m. on Saturday, November 21, at St. Peter's Lutheran church, Loganville, with Rev. George Gutzman officiating. Interment was in the church cemetery. The family received friends after 4 p.m. on Friday at the Hammer Funeral Home, Reedsburg. Taken from the Reedsburg Paper. Martha M. Wawrock obtained US Social Security Card at Wisconsin; last residence Reedsburg, Sauk, Wisconsin. Children of Martha M. Wawrock and August Schlieckau Sr.
[S245] U.S. Federal Census 1900 U.S. Federal Census, by Ancestry.com, Year: 1900; Census Place: Honey Creek, Sauk, Wisconsin; Roll T623_1816; Page: 10A; Enumeration District: 137. William Schlieckau was born on 22 September 1865 at Germany also reported as Aug 1866. William Schlieckau married Catherine Anna Elling, daughter of Johann Hinrich Elling and Anna Catherine Margaretha Dierks, on 4 March 1897 at Haven, Reno, Kansas. William Schlieckau was listed as a beneficiary in Henry Schlieckau's will on 24 December 1901 at Sauk, Wisconsin. William Schlieckau died on 14 June 1941 at Loganville, Sauk, Wisconsin, at age 75; also reported as 15 Jun 1941. William Schlieckau immigrated with Henry Schlieckau and Maria Harms on 2 June 1868; George arrived, by ship, in America with his older brother Henry and Henry's family in 1868. [S181] Wisconsin, Sauk Co Cemetery Records Vol 2, pg 75. [S244] U.S. Federal Census 1910 U.S. Federal Census, by Ancestry.com, ED130. Dwelling 119. Stamp 66. [S243] U.S. Federal Census 1920 U.S. Federal Census, by Ancestry.com, Sheet 8B. ED171. Dwelling 167. [S250] U.S. Federal Census 1930 U.S. Federal Census, by Ancestry.com, ED56-39. Dwelling 119. Name Variation Catherine Anna Elling was also known as Katherine. Name Variation Catherine Anna Elling was also known as Kate. Married Name 4 March 1897 As of 4 March 1897,her married name was Schlieckau. Catherine Anna Elling was born at Gross-Heins, Hanover, Germany, on 24 June 1875. She was the daughter of Johann Hinrich Elling and Anna Catherine Margaretha Dierks. Catherine Anna Elling married William Schlieckau, son of Henry Schlieckau and Maria Harms, on 4 March 1897 at Haven, Reno, Kansas. Catherine Anna Elling died on 1 November 1955 at Loganville, Sauk, Wisconsin, at age 80. Catherine Anna Elling immigrated with Johann Hinrich Elling and Anna Catherine Margaretha Dierks on 27 March 1880; John (Heinrich) Henry Elling, Sr., wife Anna Catharine (Dierks) Elling and six children sailed from Bremen, Germany on the ship S.S. Main to the US and landed in New York, March 27, 1880. Name Variation August John Schlieckau Jr. was also known as Augie. August John Schlieckau Jr. was born on 3 February 1943. He was the son of August Schlieckau Sr. and Martha M. Wawrock. August John Schlieckau Jr. died on 2 December 2010 at age 67 August J. "Augie" Schlieckau, 67, of Reedsburg, died Thursday, Dec. 2, 2010, in Reedsburg Area Medical Center. 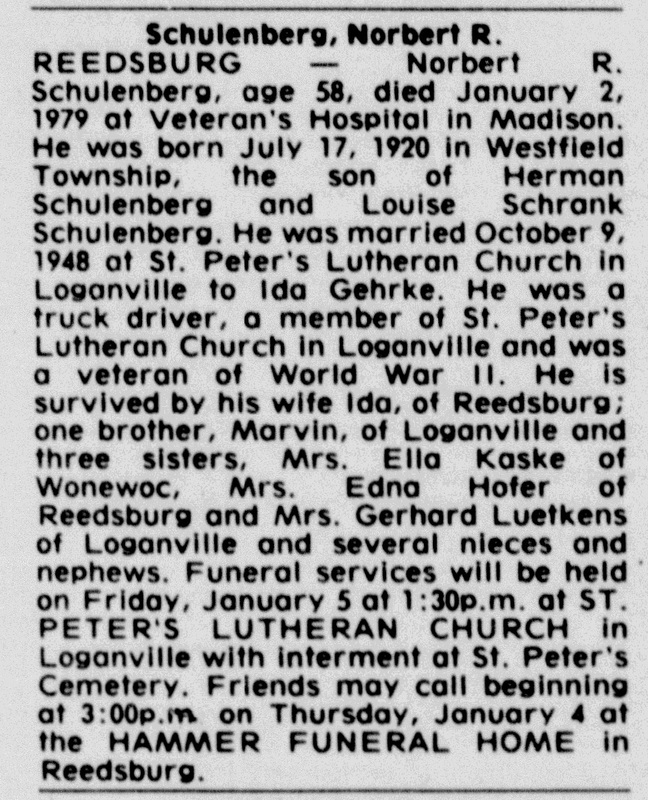 He was born Feb. 3, 1943, in Reedsburg, the son of August and Martha Wawrock Schlieckau. Augie was a lifelong member of St. Peter's Lutheran Church in Loganville. He had worked at Vernon Area Rehabilitation Center for many years. He enjoyed collecting family pictures and listening to music of all kinds. Augie will be remembered for his strong faith and his friendly attitude, all of which served as an inspiration to others. Survivors include his brothers and sisters, Frieda Craker of Reedsburg, Dorothy Albers of Reedsburg, Adeline (Joe) Stimac of Milwaukee, Walter (Alva) Schlieckau of Loganville, Marion Roecker of Reedsburg, Beverly (Richard) Schultz of LaValle and Henry (Janet) Schlieckau of Reedsburg; his brother-in-law, Dwayne White of Reedsburg; his sister-in-law, Beverly Schlieckau of Loganville; many nieces and nephews; other relatives and friends. He was preceded in death by his parents; his sister, Louise White; his brother, Harold Schlieckau; and his brothers-in-law, Edwin Roecker, Victor Craker, Raymond Albers and Victor Lucht. Funeral services will be conducted at 11 a.m. today at St. Peter's Lutheran Church in Loganville, with Pastor Christopher Miller officiating. Interment will be in St. Peter's Cemetery. Lunch will be provided following the service. There will be a visitation from 10 a.m. until the time of the service Saturday at the church. In lieu of flowers, memorials to St. Peter's Lutheran Church would be appreciated. [S181] Wisconsin, Sauk Co Cemetery Records Vol 2, pg 76. Name Variation Henry Hartwell Spyker was also known as H. Spyker. Henry Hartwell Spyker was born on 1 September 1860 at Spring Green, Sauk, Wisconsin, also reported as Ithaca, Richland, Wisconsin. He was the son of Reverand Simon S. Spyker and Rosanna Kiefer. Henry Hartwell Spyker married Sarah M. Zintz, daughter of Conrad Zintz and Magdalena Adams, on 30 January 1884 at at the residence of Chester William Davis, Ithaca, Richland, Wisconsin, Seldom has the quiet stream of social events of our peaceful neighborhood been disturbed by so huge a wave as swept over us on the evening of January 30th, on the marriage of Mr. Henry Spyker and Miss Sarah Zintz, not more on account of the high social position of the contracting parties, than on account of the social and individual worth of each. Having been reared in each other's society from infancy, they form that rare thing under the sun, a happy union, with which no one can find fault and if kind wishes of friends would do it they would be surrounded by Heaven's choicest blessings. 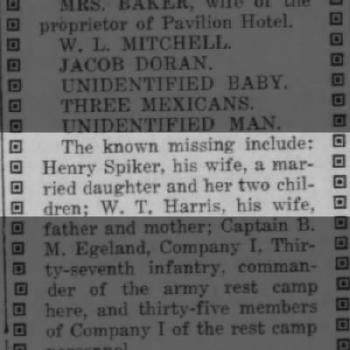 Henry Hartwell Spyker died on 14 September 1919 at hurricane, Corpus Christi, Nueces, Texas, at age 59 Henry Spiker and family had 26 people in their home. 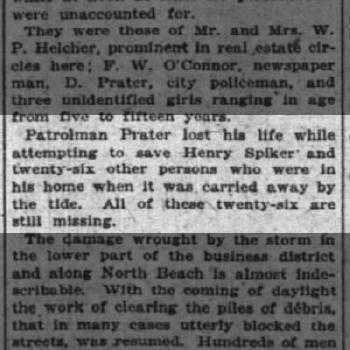 L. B. Prater, Corpus Christi policeman, brother-in-law of his daughter Leith Spyker Prater tried to assist, but drowned during his efforts. Henry Hartwell Spyker was a blacksmith in 1892. He's occupation: carpenter at Ithaca, Wisconsin, on 21 April 1910. He migrated after 1910 to . 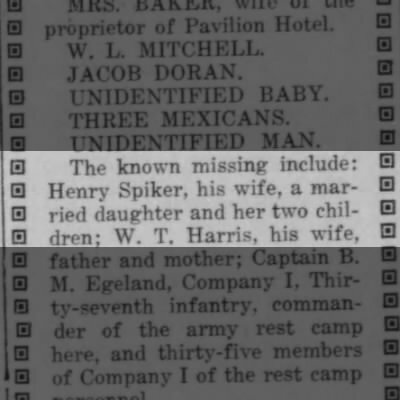 On 16 September 1919 The known missing after the 14 Sept 1919 hurricane include: Henry Spiker, his wife, a married daughter (Leith Prater) and her two children (Bernard and Edgar) - The Eagle (Bryan, Texas). On 17 September 1919 Patrolman (L. B.) Prater lost his life while attemping to save Henry Spiker and twenty-six other persons who were in his home when it was carried away by the tide. All of these twenty-six are still missing - The New York Times. Name Variation Jessie Estelle Spyker was also known as Jesse. 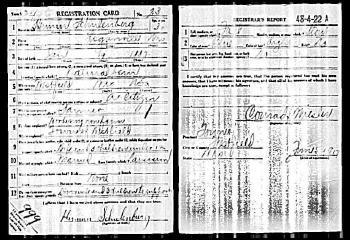 Married Name 29 April 1886 As of 29 April 1886,her married name was Freeborn. Married Name 19 May 1909 As of 19 May 1909,her married name was Langdon. Jessie Estelle Spyker was born on 17 January 1864 at Ithaca, Richland, Wisconsin. Jessie Estelle Spyker married Benjamin Franklin Langdon, son of Samuel Porter Langdon and Nancy Emory, on 19 May 1909 at second marriage for each. Jessie Estelle Spyker died on 7 January 1939 at near Indianapolis, Indiana, at age 74. 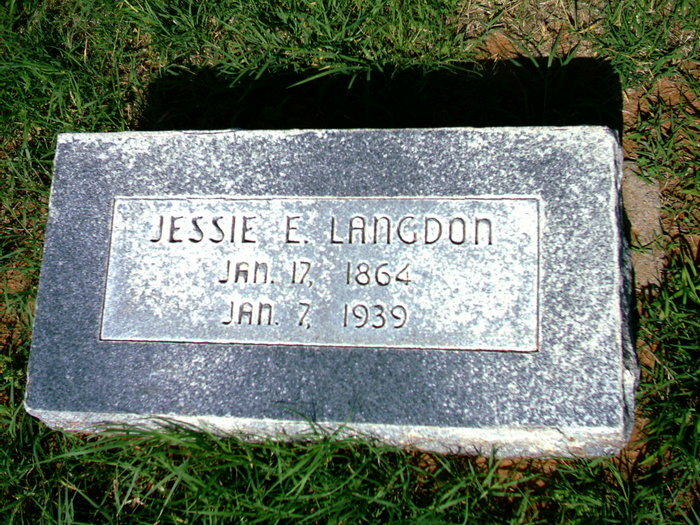 She was buried after 7 January 1939 at Greenwood Cemetery, Weatherford, Custer, Oklahoma. Jessie Estelle Spyker migrated to . She had 5 with 2 living in 1900 children. [S245] U.S. Federal Census 1900 U.S. Federal Census, by Ancestry.com, ED115. Dwelling 82. [S250] U.S. Federal Census 1930 U.S. Federal Census, by Ancestry.com, ED20-15. Dwelling 16. Jurgen Heinrich Nieman was born on 28 October 1808 at Varendorf, Hanover, Germany. He married Catherine Dorothea Kohlmeier, daughter of Hans Peter Kohlmeier and Anna Dorothea Hallensleben, on 6 December 1839. Jurgen Heinrich Nieman died on 11 January 1868 at Varendorf, Hanover, Germany, at age 59. Name Variation Catherine Dorothea Kohlmeier was also known as Dora. Name Variation Catherine Dorothea Kohlmeier was also known as Kohlmeyer. Married Name 6 December 1839 As of 6 December 1839,her married name was Nieman. Married Name 6 December 1839 As of 6 December 1839,her married name was Niemann. Catherine Dorothea Kohlmeier was born on 3 August 1818 at Varendorf, Hanover, Germany. She was the daughter of Hans Peter Kohlmeier and Anna Dorothea Hallensleben. Catherine Dorothea Kohlmeier married Jurgen Heinrich Nieman on 6 December 1839. Catherine Dorothea Kohlmeier died on 20 November 1882 at Wisconsin at age 64. She was buried on 23 November 1882 at St John Lutheran Church, Reedsburg, Sauk, Wisconsin. Name Variation Heinrich Christian Nieman was also known as H.
Name Variation Heinrich Christian Nieman was also known as Niemann. Name Variation Heinrich Christian Nieman was also known as Henry C.
Heinrich Christian Nieman was born on 4 December 1840 at Varendorf, Hanover, Germany. He was the son of Jurgen Heinrich Nieman and Catherine Dorothea Kohlmeier. Heinrich Christian Nieman married Catharine Dorothee Margarethe Schliekau on 23 May 1869 at Natendorf, Hanover, Germany. Heinrich Christian Nieman married Dora Kate Heferman on 1 November 1879 at St John Lutheran Church, Reedsburg, Sauk, Wisconsin, also reported as 01 Nov 1877. Heinrich Christian Nieman died after June 1900. Port of Departure: Hamburg, Germany. In 1880 HENRY NIEMANN, farmer, Sec. 22; P. O. Reedburg; born in Hanover, Germany, Dec. 4, 1840. Mr. Niemann came to America and direct to Reedsburg, Wis, in 1870, and bought his present farm of 90 acres; his occupation in Germany was farming; each year, for seven years, he gave one month's service to the army while he lived in his native land. Mr. Niemann has been twice married; his first wife was Miss Margaret Schliekan, to whom he was married May 19, 1869; she died Feb. 3, 1879, leaving two children - Herman, born March 17, 1870, and Emma, July 11, 1872; Mr. Niemann was married the second time, Nov. 1 1879, to Miss Kate Heferman, who was born in Hanover, Germany, in May 1856. Mr and Mrs. Niemann belong to St. John's Church of Reedsburg. [S245] U.S. Federal Census 1900 U.S. Federal Census, by Ancestry.com, ED857. Dwelling 41. [S356] Wisconsin, Standard History of Sauk County, Wisconsin, page 723. Name Variation Dora Kate Heferman was also known as Katharina Hoefermann. Name Variation Dora Kate Heferman was also known as Kate. Name Variation Dora Kate Heferman was also known as Dorothea Catharina. Married Name 1 November 1879 As of 1 November 1879,her married name was Niemann. Married Name 1 November 1879 As of 1 November 1879,her married name was Nieman. Dora Kate Heferman was born in May 1856 at Hanover, Germany, also reported as Apr 1856. She married Heinrich Christian Nieman, son of Jurgen Heinrich Nieman and Catherine Dorothea Kohlmeier, on 1 November 1879 at St John Lutheran Church, Reedsburg, Sauk, Wisconsin, also reported as 01 Nov 1877. Dora Kate Heferman died after June 1900. 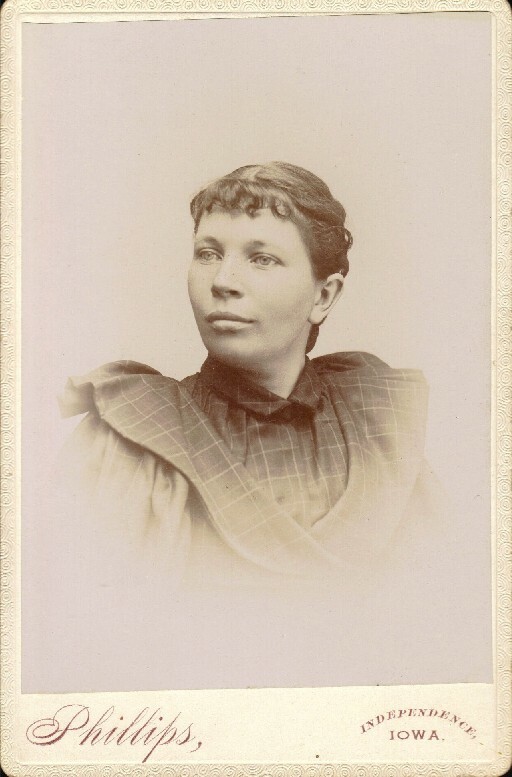 Dora Kate Heferman immigrated on 1 November 1879. She had 3 with 2 living in 1900 children.